Nitra is a city in western Slovakia, situated at the foot of Zobor Mountain in the valley of the river Nitra. 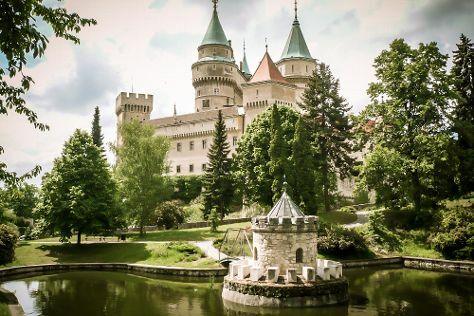 Explore Nitra's surroundings by going to Bojnice (SNM - Bojnice Castle Museum & Bojnice Zoo), Trencin Castle (in Trencin) and Beckov castle (in Beckov). There's lots more to do: explore the historical opulence of Nitra Castle, steep yourself in history at Cathedral of St. Emeran, take in nature's colorful creations at Banska Stiavnica Botanical Garden, and learn more about the world around you at Open-Air Mining Museum (SMM). To find photos, traveler tips, other places to visit, and other tourist information, go to the Nitra trip itinerary maker app . If you are flying in from France, the closest major airport is M. R. Štefánik Airport. Wrap up your sightseeing on the 10th (Sun) early enough to travel back home.